@ChasingASMBlog I’d love to see #82 featured, its the first comic I ever read. Since I’m totally the kind of a guy who sympathizes with a person’s attachment to his very first comic, I will gladly oblige on this one Sean. Plus, it gives me an opportunity to write about a fun little Stan Lee/John Romita Sr. story, and I’m always a fan of that. As just a quick aside, I first picked up this comic a few years ago when I had gotten my “quest” number to under 100 issues and I decided to visit mycomicshop.com on a monthly basis and buy a stack of Silver Age ASM’s in low/mid-grade every month until I narrowed my chase down to the most expensive issues. There was something so robotic and emotionless about this spending spree I was on, but ASM #82 stood out to me among the others because I’ve always been a fan of Electro and I just loved how JRSR drew him in this comic. Peter Parker’s reluctance to honoring his “great responsibilities” as Spider-Man is an idea that’s been explored going back to the very earliest issues of Amazing Spider-Man, but as comic book critics who have much better credentials than I have noted, the official “soap opera” period of ASM was jump-started by the arrival of John Romita Sr., who changed the visual style of the title from Steve Ditko’s cartoony-look to a greater focus on realism. And a big reason why Romita’s pencils played such an essential role in changing the tone of the book is because his characters – especially his women – looked like real people (and attractive people). I find it’s much easier to accept that Peter is conflicted about choosing between his obligation to being Spider-Man or his innate desire to having a normal teenaged romance with Gwen Stacy or MJ when the women his pining for are drawn so wonderfully. Simply put, Ditko’s women were too stylized and lacked the relatable beauty of Romita’s. I was never invested in Peter’s early relationships with Betty Brant or Liz Allen because they looked like cartoon characters with contorted faces (or as Longbox Graveyard puts it, Ditko faces). On first blush, the tonal shift from Lee/Ditko and Lee/Romita isn’t THAT dramatic – especially based on the issue’s opening splash page. We’ve seen this kind of image before from Ditko – a forlorn Peter wondering how he can continue at his current pace balancing his superhero life with his personal life. But there are subtle differences that mark the soap opera-iness of this era of stories. Since when did Peter really care about what his inability to get along with Flash Thompson (answer: because he doesn’t want to look like a creep around Gwen anymore)? But Peter eventually realizes that his real problem with Gwen isn’t a financial one. He feels extraordinarily guilty about the fact that he hasn’t come clean to Gwen about his double-life as Spider-Man. This guilt would of course be magnified by a thousand a mere eight issues later when Spidey’s battle with Doc Ock causes a side of a building to fall and kill Gwen’s father. 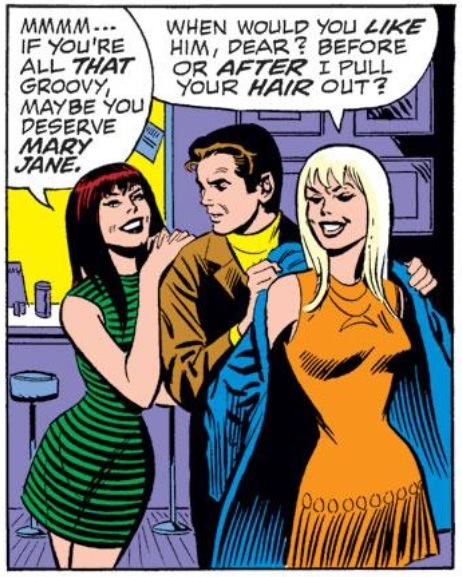 Just to add another layer of poor Peter’s “woman troubles” is the fact that the free-spirited MJ keeps making plays for his affections in front of Gwen (watch me play the world’s smallest violin about that), leading to a classic “Betty and Veronica” type exchange between the two ladies. 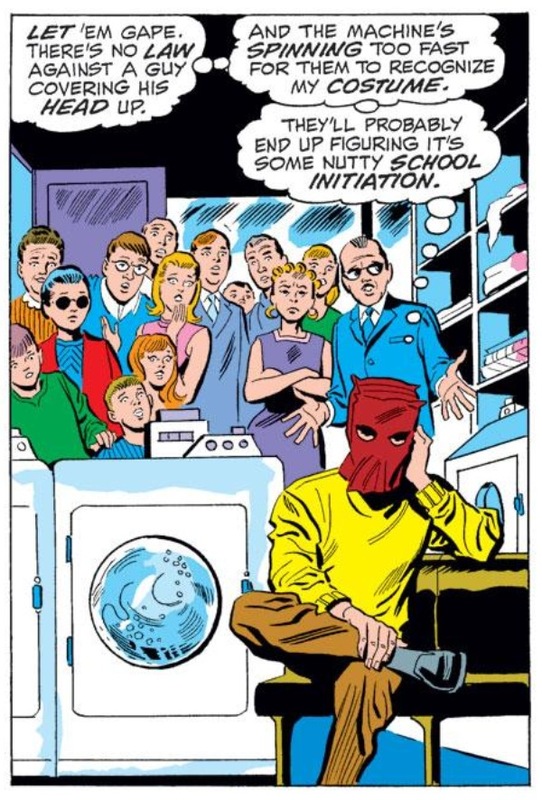 Intentionally or not, all of the romantic melodrama with Gwen throughout this issue (which also includes a classic scene of Peter needing to clean his costume at a laundromat with a paper bag over his head) diverts attention far away from the baddie-of-the-month. While the teenage-romance angle is actually a lot of fun to read about, I think ASM #82 marks a miscalculation from Lee/Romita here since the villain du jour is someone who should be treated with a bit more gravitas. 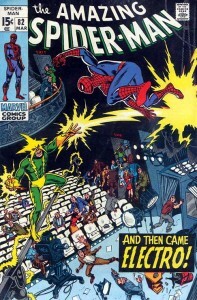 The comic marks only the second Electro/Spider-Man one-on-one confrontation, and the first one since his debut in ASM #9. Considering Electro is a core member of the original Sinister Six (thus making ASM #82 his third overall appearance in a Spider-Man comic if I’m doing my math correctly), his role in this story feels like a wasted opportunity in retrospect. Electro’s fight with Spider-Man is beautifully drawn by Romita (to the surprise of no one), and a television studio is certainly a sensible location for a battle with a villain who is made out of electricity, but considering how the return of Electro is really only treated as the issue’s C-level story, I wonder if Lee/Romita would have been better off dusting off some random C- or D-lister so as not to waste that bullet for a story where Peter’s personal life is front and center. It probably sounds like I’m being negative about this issue (sorry if I’m insulting your first issue Sean), but in reality I think I’m just speaking as someone who likes Electro more than most people. 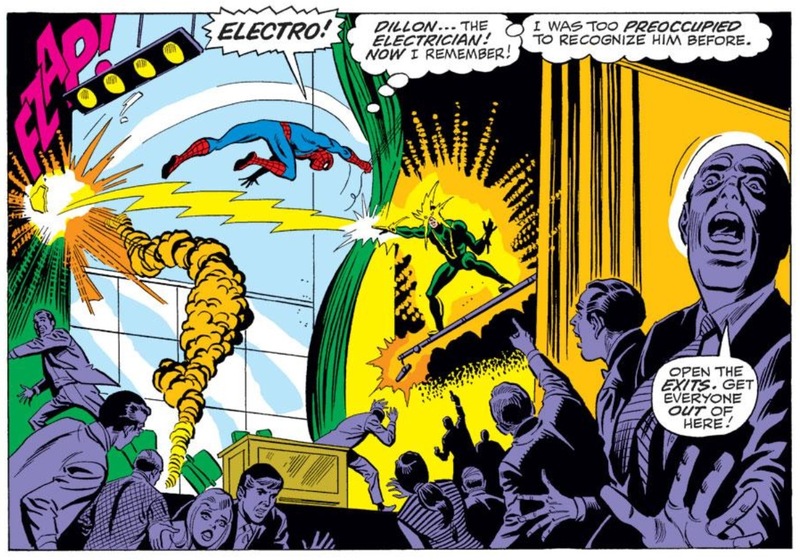 I’ve long considered Electro part of the upper pantheon of Spidey villains (not in the top five, but certainly in the top 10), and up until this point in ASM history, none of the true upper-crust Silver Age villains like Green Goblin, Doc Ock, Lizard or Mysterio, had been used in such tertiary fashion by the creative team. 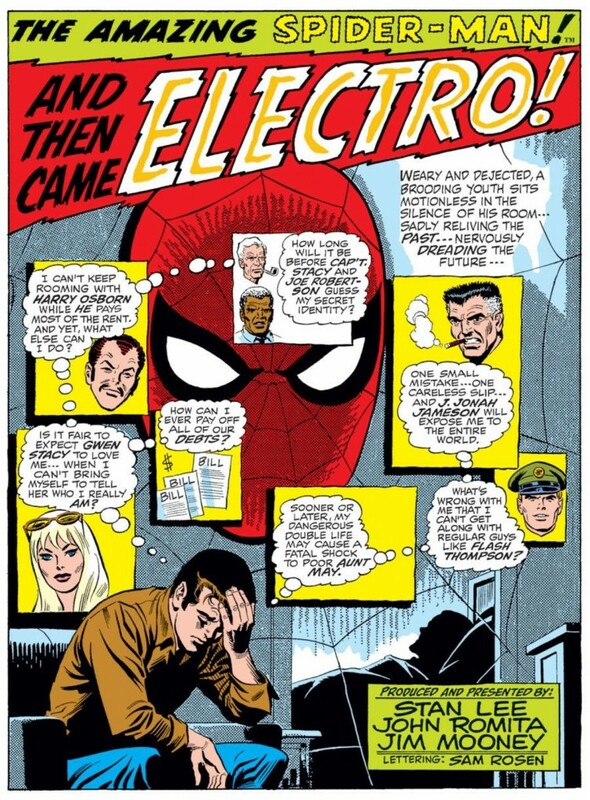 There would be better days (and stories) for Electro, but it’s very clear after re-reading this issue that unless his superpower was to morph into a beautiful blonde or a foxy redhead, ASM #82 was not designed to be memorable as an Electro appearance. Loved the link to the Ditko faces gallery. I actually prefer Betty Brant to Gwen in the Lee-written issues. With Romita’s art, Gwen was certainly more beautiful, but also a bit more wooden and doll-like. I always thought Romita’s movie-star look for the characters ran a bit counter to the core ideas of Spider-Man, although it looks undeniably great. Your bit about Electro seems somewhat tinted by hindsight. Probably, as far as Lee and Romita were concerned, Electro WAS a C-lister. As you say, he had only fought Spider-Man twice before in a span of 90 issues. Being in the Sinister Six was no distinction at all, since the idea behind their creation was simply to have Spidey fight his entire rogues gallery up to that point. If I had to guess at who Stan thought was a top-tier Spider-Man villain, I would definitely put the Vulture in his A-list. Ironically, given his ultimate fate, Kraven would probably be in there as well. Cass, that’s a fair point that I’m Monday Morning Quarterbacking with Electro here, but I’m also very candid with the fact that I just like him as a villain and on a personal level that’s where the disappointment stems from. It also doesn’t change the fact that the story of this comic is Peter needs money for Gwen, not Spider-Man vs. Electro. Granted, that’s not the first or last time that happened in a Spider-Man comic, but I thought there was something inadvertently symbolic about the fact that Romita’s “return” issue was such a trademark Stan/JRSR soap opera issue.